In The Fight, his classic account of the “Rumble in the Jungle”, Norman Mailer arrives in Zaire to learn that George Foreman has cut his eye during training and the showdown with Muhammad Ali is postponed. This is just as well, because Mailer is suffering from “some viral disruption” and is in no shape for reporting. I often recall Mailer’s words when I’m in Burma, which has inflicted more torture on my intestines than any other country. That includes a savage bout of food poisoning during a recent trip to lush and rugged Kachin State, in the far north. You would think that after 18 years of reporting from Burma’s remotest corners I’d have all the antibodies. But not for whatever was lurking in the fried prawns at Mandalay Airport’s transit restaurant. I’m not the only seasoned traveller susceptible to King Thibaw’s Revenge. In Rangoon I bumped into Stuart McDonald of Travelfish, the backpacking guide to Southeast Asia, and was delighted to discover that he’d been really sick too. With something close to awe, Stuart told me how food poisoning in Bagan had fricasseed his innards and put him out of action for days. This is why an essential tool for any Burma visitor is some kind of anti-diarrhoeal drug. 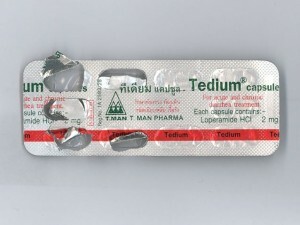 That’s usually Imodium, although here’s a photo of a brand I bought in Thailand. It not only alleviates the condition but, in a single word, captures the experience.